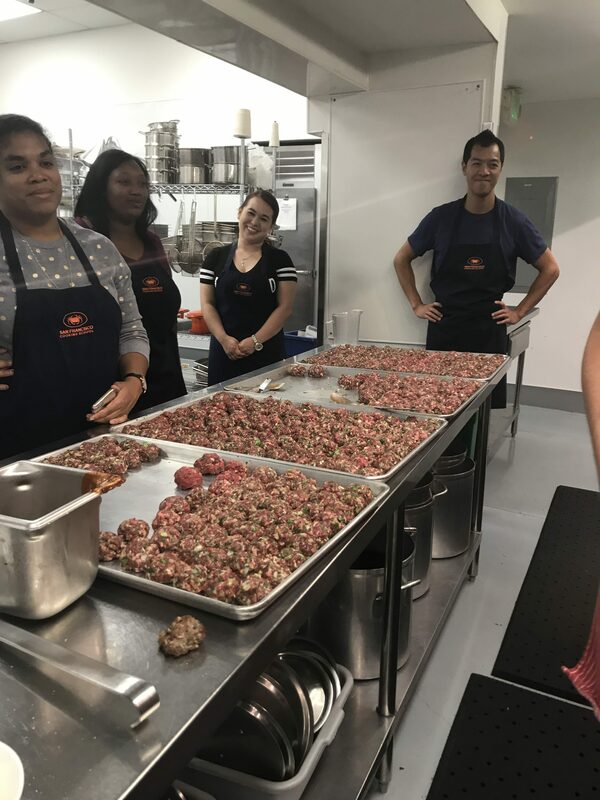 The other week chef Jessica Battilana came in to teach us a wonderful recipe that would also help the victims that were affected by the recent Northern California fires. 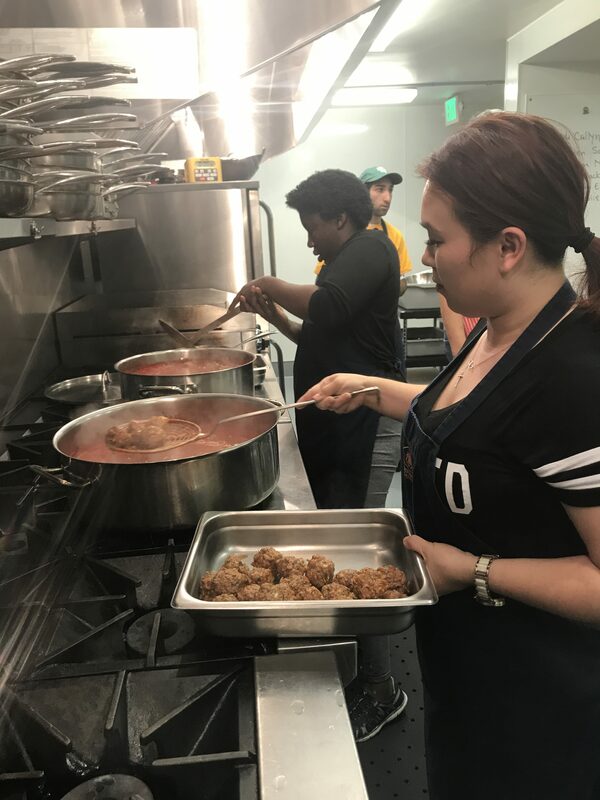 Chef Jessica and the students were able to prepare 450 albondigas, a Mexican style meatball. Unlike the Italian meatball that uses breadcrumbs as a binder, this version uses rice. This recipe is also featured in her cookbook, Repetoire, which hits the bookshelves in spring 2018. The first thing we did was bring some tomato sauce with cinnamon to the boil and simmer and mix our ground beef with onion, cilantro, and a few eggs. Chef said to not stir, squish instead, this will keep your meatballs tender. Once mixed thoroughly roll into golf ball sized spheres. 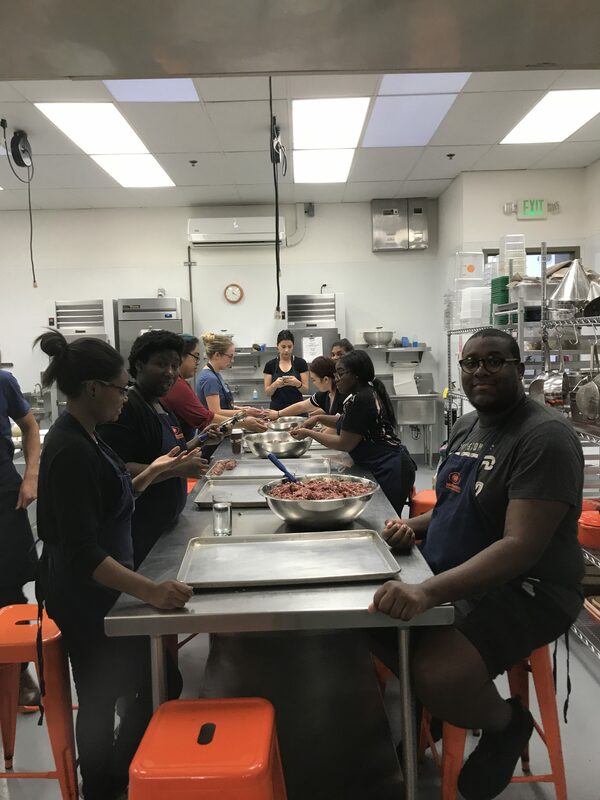 Chef along with some students were poaching the meatballs. Each ball takes about 20 minutes to cook. Rice was cooking in the oven while the meatballs were poaching above. When the meatballs were done cooking and resting spinach was dropped into the pot, absorbing all the flavors from the cinnamon and beef. 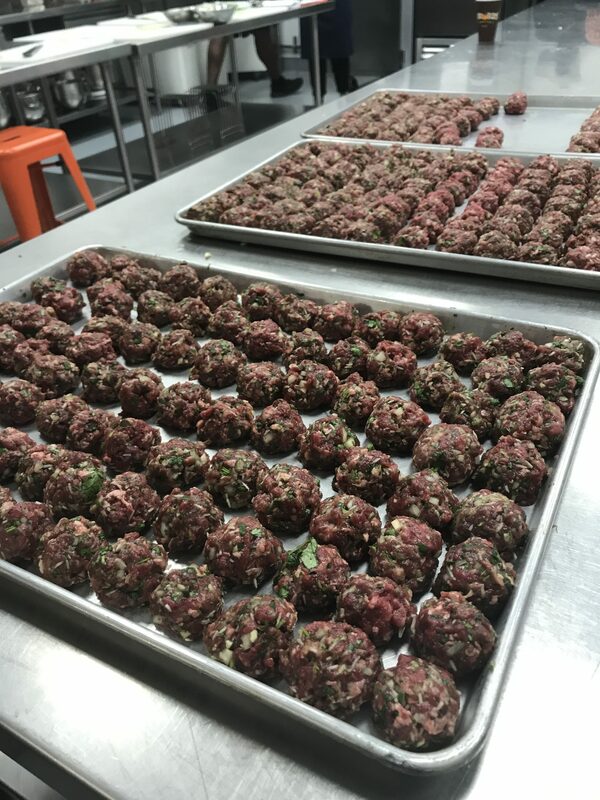 All 450 meatballs, rice, and spinach were all made in just an hour and half. The food was then taken to the Salvation Army food drop-off point to help feed victims and service men and women who fought the recent fires in Northern California. More than 200,000 acres burned and upwards of $3 billion of damage. We are truly hoping you all are recovering well and keep you in our thoughts. We hope you enjoyed the albondigas as well. This recipe will make about 16 meatballs (feeds 4-6 people). Put the rice in a small bowl and add cold water to cover. Let soak 20 minutes, then drain. Put 4 of the eggs in a medium saucepan (reserve the fifth egg) and add cold water to cover. Bring to a boil over high heat, boil for 1 minute, then remove from the heat and cover. Let stand 8 minutes, then transfer the eggs to an ice-water bath. When cool, carefully peel the eggs andquarter them. Set aside. In a large bowl, add the rice, beef, white onion, garlic, cilantro, mint, olive oil, salt and the remaining (raw) egg and mix well to combine. Take a small amount of the meat mixture and use your hands to form into a thin patty. Place a hardboiled egg quarter in the center of the patty, then form the meat mixture around the egg, enclosing it completely, and shape into a sphere. Repeat with the remaining meat and eggs until you’ve formed all 16 meatballs. Pour the tomato sauce and chicken stock into a large high-sided saucepan or pot. Add the minced chipotles, adobo sauce and cinnamon sticks and stir to combine. Put the meatballs in the pot, arranging them snugly in a single layer (the meatballs will be poking out of the sauce). Bring to a boil over medium-high heat, then reduce the heat so the sauce is simmering gently. Cover and cook for 10 minutes, stirring gently after the meatballs have cooked for 5 minutes. Use a slotted spoon to transfer the meatballs to a serving dish. Remove the cinnamon sticks from the sauce and discard, then increase the heat so the sauce is simmering vigorously. Stir in the spinach and cook until the spinach is wilted, about 5 minutes, then pour the sauce over the meatballs. Serve hot, accompanied by white rice.